One of the first things that pool swimmers discover when transitioning to open water swimming is a difference in the water surface – it is rarely as smooth as a pool. Whether a surface ripple, a light chop, variable swells, a tide, a visible current, or true waves with whitecaps, these new variables will challenge the discipline of your pool stroke. The question arises: can you really continue to swim as if you are in a pool? When encountering waves, you may feel you are fighting the water, prompting the consideration of trying to work with the waves. Try to swim through (or underneath) some if they are large and coming head on, and float over some others to take advantage of being at the top of a wave. And if there are waves coming from the side, you may need to become a one-sided breather, and you may need to correct your swim path regularly because you are being pushed sideways. Paradoxically, if you can relax your body while swimming in wavy conditions, you can feel what the water is doing better, which improves your navigational abilities and can even make it fun! 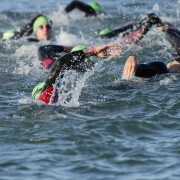 Essentially, then, windy, wavy conditions demand adjustments – to your mental preparedness, to your willingness to adapt to changing conditions, to your stroke, to your breathing and stroke cadence, and to your sighting techniques. First, as always, establish an easy, and complete (with complete emptying) breathing cycle that does not accumulate carbon dioxide. Staying relaxed remains more essential than ever. An open water swim buoy can help with this. If the conditions elicit fear or overwhelm your abilities, you probably shouldn’t be out there, unless you are practicing in shallow water with a group to develop your skills. If your swim stroke cadence and breathing cycle can stay easily adaptable and changeable with every wave, you can actually enjoy swimming in rough water, like surfers that have learned to adapt to every wave. Work to feel the rocking peak-and-trough pattern of the waves and adjust to it. When you are in a trough, with a new wave possibly about to swamp you, you might say to yourself, “this is not a good time to breathe”, and just glide for an extra second or two while continuing to expire before attaining the next high point, where the breathing and the sighting becomes easy. You are simply learning a new dance. Swimming a straight line is a major challenge in open water–there are no dark lane lines on the lake bottom to guide you, and ripples in the sand may not be reliable. To swim straight, you have to look forward with your eyes out of the water. “Sighting” is simply the process of popping your head up to look forward to a landmark that you should have at least thought about before you started swimming. It can be useful to look for landmarks that are off your intended course, so that when you see them, you know to change course. Sighting is most easily done by extending the neck and head upward or by pushing down slightly with your reaching hand to allow your head to pop up just enough to see (think alligator), just before you turn to breathe. A quick glance forward once your eyes clear the surface, before turning the head to inhale. How often you sight is dictated how straight you normally swim, or by how much you may be being pushed off course by the wind, waves, or current. Sight only as much as necessary–lifting your head too high can be hard on your neck, cause the wetsuit to chafe your neck, and can cause your legs to drop, compromising the efficiency of your body position. This sighting technique will not be very useful if you are in a trough between waves when you look for a landmark, as instead, you will just see a wall of water. Herein lies the need to feel the rocking nature of the waves, so that you can sight when at or near the crest of a wave. The bigger the waves, the more helpful it is to sight for a higher landmark, like a mountain, as opposed to a buoy, which you may not be able to see. In less familiar circumstances such as wind and waves, staying calm and in control of your breathing, your stroke, and your ability to sight to stay on course is more important than ever. Try using a safety swim buoy so you are seen by other boaters, and stay flexible and willing to adjust to the water waves and movements. Work with the water conditions, not against them. 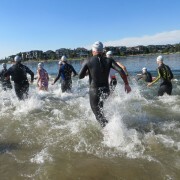 Repeated exposure and practice in all water conditions increases comfort when challenged with common open water variables, especially wind and waves. Always bring an open water swim buoy! In the last post, we considered the importance of complete expirations in the water and a normal breathing rhythm while swimming freestyle, to avoid the build-up of carbon dioxide (which drives the urge to breathe), shortness of breath, anxiety, and even panic when not done adequately. In this discussion, we consider the importance of rate of breathing while swimming and the use of a safety swim buoy. Just like breathing on land, breathing while swimming should vary somewhat with exercise intensity, but the difference is that swimmer’s breathing rate is regimented and dictated by the cadence of your arm strokes. Essentially then, the only time you can breathe in is in a short window as you turn your head to one side, and leaving a disproportionally longer time to breathe out, while your face is facing down, with your head almost completely submerged in the water. It would almost seem to need the luck to be able to match your breathing rhythm to your arm stroke rhythm without either hyperventilating or not breathing enough to meet the exercise demands of swimming. Either way, you cannot sustain this breathing rate, causing you loss of control of your breathing and then your stroke pattern, and with it anxiety. How does one keep a breathing rate both under control, and yet modifiable as demands of exercise increase? There are two answers to this seeming conundrum. First, recall that swimming is the only exercise where you have to build your stroke around your breathing (not the other way around). So one needs to get comfortable gliding with each of your strokes – holding one arm straight out in front of you, while the other rests at your side after completing a pull phase until you have adequately expired into the water and you are ready to breathe in again. Your stroke rhythm and your physical movements wait for your breathing cycle to be completed; your stroke is built around your complete breathing cycle. To get good at this, always start swimming this way, to practice establishing your breathing cadence over everything else. The second variable to manipulate is your breathing cycle. Most swimmers are taught to breathe (and therefore swim) symmetrically, to breathe on both sides, separated by 3 alternating arm strokes. Breathe in on the left side, then, while continuously expiring, right arm, left arm, and right arm pull before turning to the right to breathe in. This is called breathing every three. However, this may be too easy or too hard, depending on how hard you are swimming, so what is the alternative? Learning how to alter cadences. Many sprinters will breathe every two arm strokes, breathing on the same side. Long distance swimmers may start breathing every four or even five arm strokes, given that they may have developed large lung capacities. And most important, experienced swimmers can change easily if they need to. They change from breathing from every 4 to every 3, and sometimes breathe every two arm strokes as they need to, whether for more air, because they missed a breath because of a wave, or because they needed to sight off to the other side at that time. 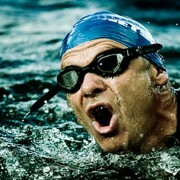 An experienced swimmer can alter breathing cadence on the fly without needing to stop to regroup. Occasionally, even good swimmers find themselves hyperventilating with a loss of control of breathing. They may have swallowed water, didn’t warm up properly, started swimming too fast, got hit by another swimmer, or underestimated the coldness of the water. When this happens in open water, it can be initially scary, as they may not be any immediate safety platform or open water swim buoy to grab onto, which may intensify the anxiety of the moment. Here too though, there is a solution: having a reliable recovery stroke to return to (your happy place), be it heads up breast stroke, side stroke, backstroke, simply easy treading water, or having a safety swim buoy to hold on to. All of these are, of course, much easier wearing a wetsuit, which provides warmth and floatation while you recover your breathing, and usually settles within 1-2 minutes if the head stays out of the water. To find your happy place, you need to practice it in open water (preferably using an open water swim buoy), until you can trust your ability to get to it, in case of loss of breathing control. When your respiratory rate has returned to normal, restart your swim stroke easily, gliding long enough with each breath to regain breath control. 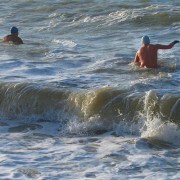 This column will provide some simple open water swimming tips, including recommending to buy open water swim buoy, and will be written by the members of the Across The Lake Swim Society, who has been encouraging people to safely enjoy swimming in open water well enough to, yep, swim across our fine lake. Imagine walking briskly for a few hundred meters, breathing out quickly and incompletely every 3rd step, and inspiring quickly right after that—how long would it take before you got short of breath? So the first fact you need to know: Swimming is the only sport where breathing matters — a lot. It is the only sport where you need to build your technical skills (your stroke) around your breathing, not the other way around. If you are a beginner, you may want to start even just standing in a pool, developing a breathing cadence that is manageable first—every expiration is with your face in the water, and every inspiration is where your face is out of the water. This should feel boring and repetitive before you proceed to move slowly in the water, perhaps with fins on, repeating the same thing: every expiration is in the water, every inspiration is out of the water. Start with a side stroke position, propelling yourself with your fins only, with one arm extended with your face exposed out of the water, turning your face into the water to breathe out. Try this on both sides, and when ready to try it, alternate to the other side while moving forward. Beginner swim classes for children and adults are available at most YMCA’s and local swimming centers to work through these basic principles. The second fact you need to know: The drive to breathe is not dictated as much by lack of oxygen as it is a build-up of carbon dioxide. So it means that, as you become short of breath in most circumstances, the solution is not to gasp for more air, but in fact to more completely blow carbon dioxide out. Try hyperventilating briefly—e.g., take 5-10 full excursions of air, focusing on blowing air out completely with each breath—and then stay still, and feel what that does to your breathing rate. You will notice that you will have little urgency to breathe. So while it would seem that swimming 25m of a pool should not cause shortness of breath after less than a minute of exercise, the reason it does so is because of the progressive carbon dioxide retention in the lungs and body, as a result of repeated, incomplete emptying of your lungs. Learning to breathe out (and not so much in) well is the first key principle to keeping the drive to breathe under control. Developing a comfortable and flexible rhythm of inspirations and expirations while swimming is equally important. When doing a freestyle stroke, the need to breathe out completely with every breath has to become automatic, with every stroke. For some, it can help to hum nasally and continuously as soon as your face enters the water, so as to prevent CO2 retention, to prevent water going up your nose, and so as not to breath-hold; and it helps to give one last surge of expiratory effort just before turning to breathe, again through the nose, for complete emptying. When turning the head, take a breath in with your mouth, which is much more efficient for inspiration than breathing in through your nose. Learn a pattern of prioritizing nasal breathing with expiration, and exclusively oral breathing with inspiration. As you work harder, the expiration can become a combination of both oral and nasal breathing, but it always needs to be complete. If this pattern of breathing continues to be difficult, try simple slow breast stroke, with your head mostly out of the water as you breathe in, and blowing out slowly but completely as your face dips into the water as you extend your arms forward. Practice this as a breathing drill, not a swimming drill, until you can do it all day without becoming short of breath. If practicing in the open water, we suggest an open water swim buoy so you can be seen. This safety swim buoy is towed behind you with no drag but is highly visible.